Like all products, the electric toothbrush has a history. It is not the most glamorous or exciting but without it we would not have the super scientific brushes that we have today. 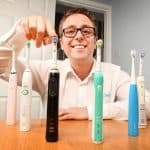 In this article we’ll take a detailed look at how the modern day electric toothbrush came to be. But before we get started here’s a quick timeline outlining its evolution. In the image below we’ve plotted the key dates from the first known occurrence of the toothbrush to the existence of the modern day electric toothbrush. 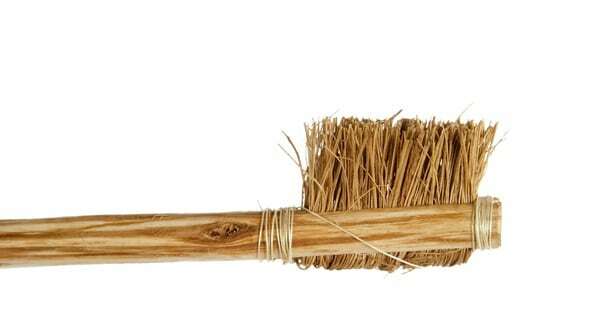 Since man first existed there has always been some form of tool to assist in the cleaning of the teeth. Tools such as a stick with a frayed end, date back to 3500-3000 BC in the era of Babylonians and the Egyptians and give clues to teeth cleaning habits. Tombs of the ancient Egyptians have been found containing toothsticks alongside their owners further confirming that tooth care was considered even all that time ago. Around 1600 BC, the Chinese developed “chewing sticks” which were made from aromatic tree twigs and were designed to freshen the breath, some could argue this was the equivalent to chewing gum today. The first known bristle brush that resembles the toothbrush we know today dates back to around 700AD in the Tang Dynasty. Using hog hairs as bristles, the handle was made from an animal bone or bamboo. It was not until much later that the concept of a toothbrush caught on and became more popular. In 1690 the first use of the word ‘toothbrush’ came from an English gentleman named Anthony Wood who wrote this within his autobiography. The first toothbrush of a more modern design was made by William Addis in England around 1780. The handle was carved from cattle bone and the brush head was still made from swine bristles although it is reported that some used horsehairs and even feathers in preference. 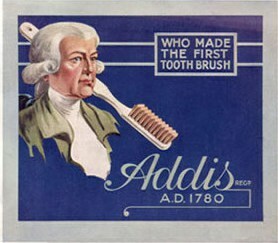 Addis began mass production of the toothbrush to the point that by 1840 the popularity forced him to expand his business and production into larger premises. In 1844, the first 3-row bristle brush was designed and by the 1860’s Addis company was one of the first to use automated manufacturing systems. It was too around this time that toothbrush manufacture in the USA took off. 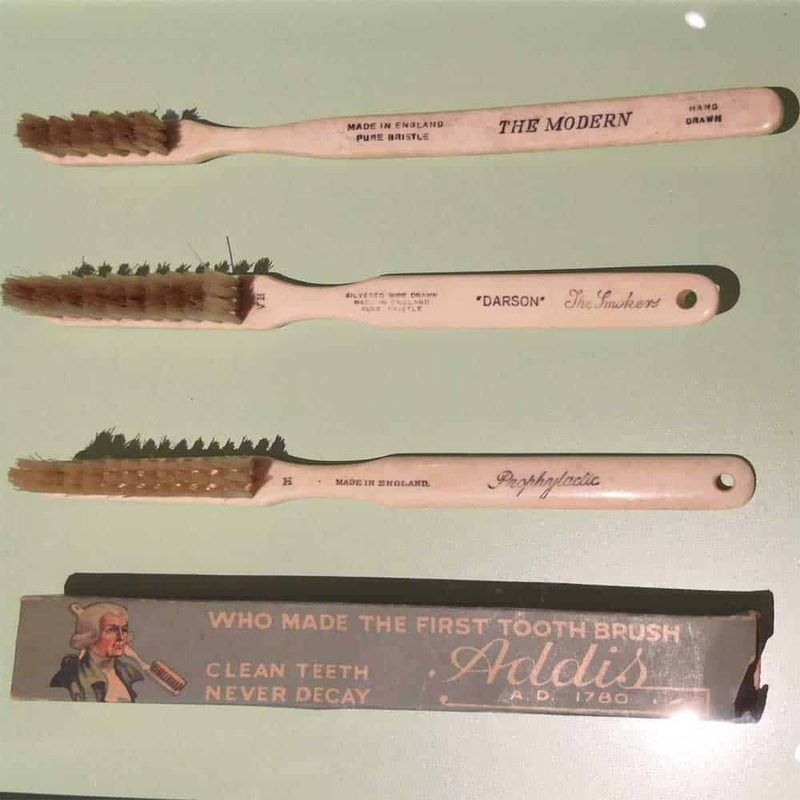 1869 was the year in which the Addis company manufactured a toothbrush handle entirely by machine. World famous Napoleon Bonaparte, statesman and military leader would apparently brush carefully morning and night according to his biographer. He used a silver handled toothbrush with horsehair bristles (pictured below). In the industrial years of the 1800s many were inventing new products to make life better. It was in 1880 that Dr Scott an English doctor advertised the first electric toothbrush, the only issue being it used no electricity at all. It was one of several products that Dr Scott advertised as being electric when really inside the handles were magnetised iron rods. Unsurprisingly this did not really catch on, but the manual brush continued to grow in popularity. Addis continued to export internationally, but primarily to the commonwealth and even supplied troops during World War I. At this time you could purchase one from Boots (the popular high street chemist) for 5p. 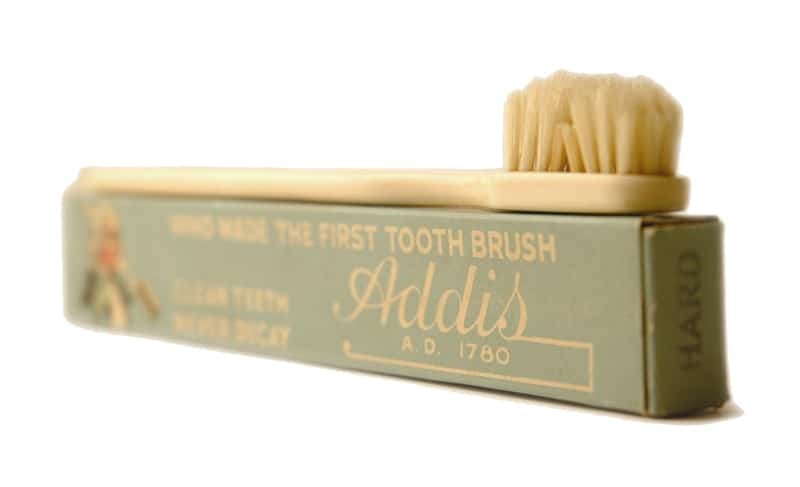 By 1926 Addis was producing 1.8 million brushes per year and the first plastic handled brush appeared in 1927, however the manual toothbrush as we really know it did not come about until 1938. Until this time only natural bristles were used until Wallace Carothers invented nylon at the E.I. DuPont de Nemours company. During World War II 1 million brushes has been supplied to the armed forces The hygiene habits of soldiers meant that the public became more concerned with oral hygiene themselves and began very quickly adopting the nylon bristled toothbrush. The first nylon toothbrush was called Doctor West’s Miracle Toothbrush within the USA whilst the Addis company developed and equivalent within europe. 50 years after Dr. Scott’s apparent electric toothbrush, Switzerland was the country in which the first real electric toothbrush came about, but it was short lived because it was said to be ineffective and sales of it were stopped. 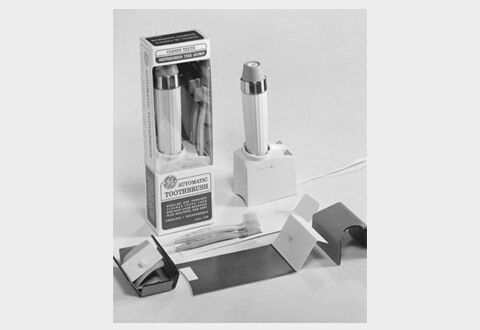 Of course a product needs to be effective, so thankfully in 1954 Dr Phillippe-G Woog invented the ‘Broxodent’, the first usable electric toothbrush. Created and manufactured in in Switzerland it was later built in France for Broxo S.A. Connecting to a standard wall outlet, the brush ran on live voltage, something that would be considered dangerous by many today. The original intention for the electronic toothbrush was to be used by patients with limited motor skills and for orthodontic patients such as those wearing braces, but in an era where modern advances were improving lifestyles there was a place for the electric toothbrush. 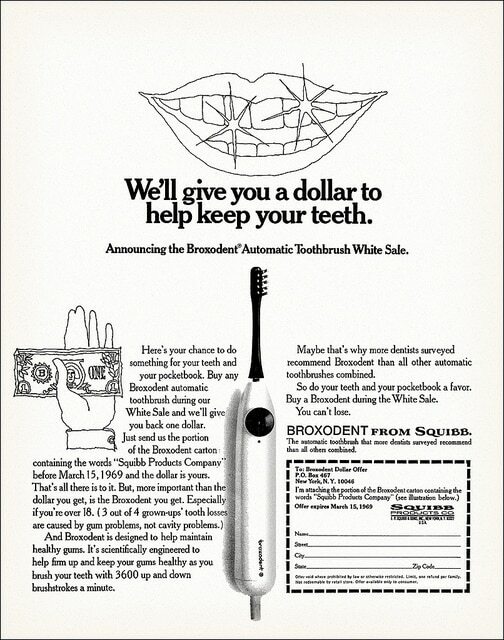 The Broxo Electric Toothbrush was introduced to and went on sale in the USA by E. R. Squibb and Sons Pharmaceuticals in 1959 who sold the brush under the names Broxo-Dent and Broxodent, it just so happened the timing aligned nicely with the 100th anniversary of the American Dental Association. By this time, demand and improvements meant that the tough nylon bristles first introduced in the 1930’s were now being made softer as people preferred these, in essence giving choice, the sort of choices you still get today when buying a toothbrush. 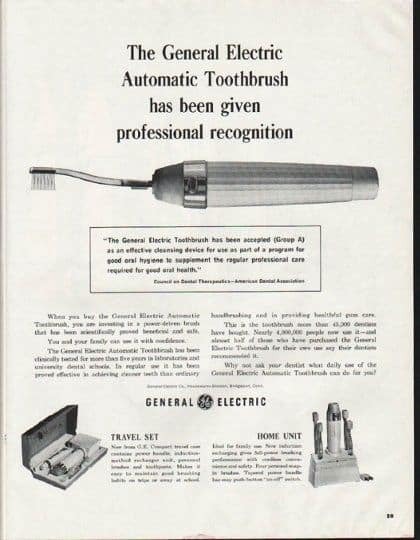 Whilst the Broxo Electric toothbrush brought improvements and efficiencies, the electric toothbrush did not sell all that well until a cordless and rechargeable model became available in 1961 from General Electric. Until the introduction of cordless brush, you had to be attached to an electrical outlet and this is likely the reason, especially when water and electricity are never particularly good together. There was somewhat of a boom after the rechargeable model hit the market. The bulky solution from General Electric housed NiCad batteries, but with battery technology still in its infancy, they suffered the memory effect, not helped by the fact that they were generally left on the charging stand, meaning a short life for these rechargeable brushes. Designed a sealed unit, the batteries could not be replaced and instead had to be discarded. Coming complete with a charging stand that held the brush upright, it set the trend and even modern brushes follow this principle. As electrics, safety and technology evolved, the early 1990’s meant that appliances like the electric toothbrush has to be changed to use a new lower voltage (typically 12, 16 or 24) stepping down the current rather than the higher voltages used previously in bathrooms. By this time the Broxo’s original design was no longer considered safe and improved battery operated brushes were providing better alternative options for consumers. 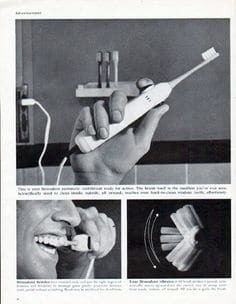 Today’s electric toothbrushes have come a long way. While some brushes on the market still can be plugged into wall outlets, most electric toothbrushes use batteries that are long lasting and rechargeable. Generally running on 12v or less the batteries are normally non-removable and rechargeable fitted inside the handle, which is hermetically sealed to prevent water damage. Gone are the metal tabs that once existed to charge early NiCd battery toothbrushes, todays electric toothbrushes use contactless inductive charging. This construction does mean it is very difficult to remove the battery from the plastic body when it comes to disposal and does pose concern environmentally, but as recycling methods improve it is likely disposal of the potential toxic batteries can be handled better. Broxo still exist to this day but brands such as Philips and Braun’s Oral-B have left Broxo with limited market share. The growth and development of this market has resulted in todays electric brushes being categorised in two ways. This is based on the design or the speed of movement. Design or brush head action is split into two categories. These categories are based on the actions of the brush be it vibration or rotation-oscillation. A vibrating electric toothbrush offers a similar technique and approach to that of brushing manually, a side to side motion. A rotating-oscillating brush works on the premise that user moves the brush slowly from tooth to tooth. Compared to the sonic brush explained below, these two types move at 3,000 to 7,500 rotations per minute, duplicating the motion of the hand when brushing teeth. A regular toothbrush typically measures at 300 strokes per minute, or 600 strokes for a two minutes of brushing. The other method of classification is based on the speed of movement in the brush head. There are three key categories within this, standard power toothbrushes, sonic toothbrushes or ultrasonic brushes. Standard power imitate the motion of the hand offering somewhere between 300 to 7,500 strokes or rotations per minute. Sonic toothbrushes include those produced by Philips and Oral-B as they have to have a motion that is quick enough to produce a ‘humming’ sound that is within the audible range of the human ear (20 Hz to 20,000 Hz). Sonic brushes typically offer 12,000-24,000 oscillations or 24,000-48,000 movements per minute. Relying on sweeping motion alone to clean the teeth, the movement that they provide is often high in amplitude which means they offer larger sweeping brush stroke motions. The first ultrasonic toothbrush, first called the Ultima and later the Ultrasonex, was patented in the USA in 1992, the same year the Food & Drug Association (FDA) in the USA gave it approval for daily home use. Ultrasonic electric toothbrushes actually use ultrasonic waves to clean the teeth more than the bristles of the brush head. To be classified as ultrasonic, the brush has to emit a wave of 20,000Hz or 2,400,000 movements per minute, considerably more than the very popular sonic technology. Under the USA’s FDA they must operate at a frequency of 1.6MHz or 192,000,000 movements per minute. The high frequency waves, but low in amplitude means the bacterial chains found in the mouth that make up plaque are broken up by the vibration and can work as far as 5mm below the gumline. Today, some ultrasonic toothbrushes, such as the Emmi-Dent, provide only ultrasonic motion, whilst ultrasonic toothbrushes, such as the Ultreo and the Megasonex, provide additional sonic vibration ranging from 9,000 to 40,000 movements per minute, comparable to a sonic toothbrush; in order to provide additional sweeping motion which removes of food particles and bacterial chain remnants. Today we have more choice than ever before when it comes to toothbrushes. There are manual and electric all of which offer different options. Available in different shapes, sizes and designs, with different grips and with different head to suit different needs, one thing that has remained consistent from the very first oral hygiene tools is a handle and bristles, just todays tools have handles that are typically of plastic construction and the brush head is made from nylon bristles which has been the case for 70 years. The difference from our ancestors is that we know more about oral hygiene, the impacts of such and the tools we used are better designed to assist with this. To this day, the effectiveness of brushes are questioned with different findings based on different research and reports. As such there is a place for both manual and electric toothbrushes, a lot will come down to preference, although there is a growing belief (perhaps through powerful marketing) that electric toothbrushes offer the best clean, although some still believe that a manual toothbrush offers a better clean than electric toothbrushes if the right brushing technique is used. Either way, what is agreed is that two cleans lasting two minutes per day is the recommended time for cleaning the teeth and a great deal of effort should be spent on ensuring you move the manual or electric toothbrush around the mouth in the right way to get an effective clean, as well as changing the brush head regularly, ideally every three months. Dentists do agree that for those with limited manual movement where there is trouble reaching the rear teeth, electric brushes do offer an advantage as was the case when Dr Phillippe-G Woog invented the electric toothbrush in 1954.
great work. outstanding article – very informative. Thank you for such a positive comment. Glad you found it useful.